The Professors World Peace Academy (PWPA) is an educational organization founded to support the academic community’s role in the pursuit of world peace. It was founded in Korea and Japan in 1973 and expanded to an international organization in 1983 with funding from the International Cultural Foundation. Throughout the 1980s and 1990s PWPA-International supported the development of national chapters throughout the world and supported hundreds of national and regional conferences. It brought the leaders of these chapters to major international Congresses that analyzed the world’s major social systems and the major challenges to world peace. This website is largely an effort to record this work. Today PWPA-USA, which also housed the PWPA International office from 1983-2000, publishes the International Journal on World Peace and has an affiliation with the University of Bridgeport. PWPA also supports the development of the New World Encyclopedia, which follows the mission of creating value-based knowledge for a world based on post-critical philosophy. PWPA is a tax-exempt 501 c (3) non-profit organization. Any donations received, general or targeted, will be used for the purposes of the PWPA mission. 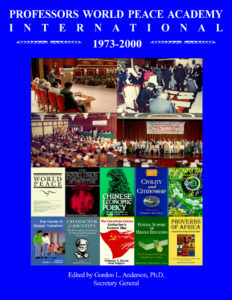 In 1985 PWPA held a major International Congress to help the world prepare for a peaceful collapse of the Soviet Union. In this video you will see predictions about the collapse of the system, and even a prediction of a nuclear disaster a year before the Chernobyl accident. 1985 Video Predicts the Collapse of the Soviet EmpirePWPA International later sponsored major conferences on China (1987) and Liberal Democracies (1989) which, if paid attention to, would help transform and revitalize western social systems.